Resin Bonded vs Resin Bound – What’s the Difference? One of the questions we get asked most often is what is the difference between resin bonded vs resin bound? The words are very similar and often accidentally used interchangeably. Many people, sometimes even experienced contractors, mix up the terminology. But, as they are two completely different resin systems it is essential you get it right. In a nutshell, the Resin Bonded system is where resin is spread across the surface and loose stone is scattered on top. The other option is the Resin Bound system where resin and stone are mixed together first, and then trowelled down into place. This is standard terminology across all resin suppliers. You may see certain suppliers use their own brand names instead of “resin bonded” and “resin bound”. For example our resin bound materials have the name BoundWorx®. Beware that the resins used for both systems are not the same. You will need to buy bound resin for resin bound, and bonded resin for resin bonded. If you’re ever unsure about what you’re buying, we would always recommend contacting the supplier to clear up any confusion and make sure you’ve purchased the correct materials. Resin Bonded vs Resin Bound – which is better? Unfortunately there is no cut and dried answer to this question when considering resin bonded vs resin bound. It depends on the intended use of the surface. 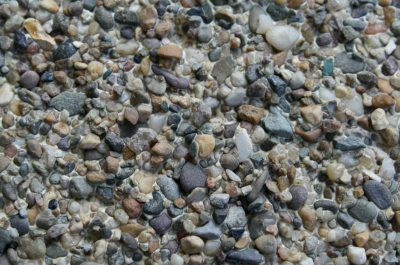 One advantage of the Resin Bonded system is that it looks and feels like loose gravel without migrating stone. 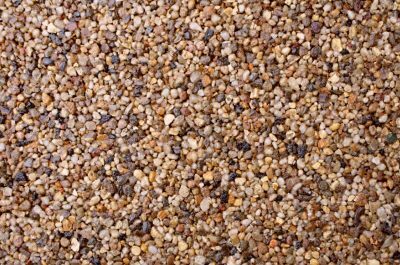 It is often preferred for traditional and historic looking properties where the modern look of Resin Bound would not fit. The finished surface has a textured feel and provides high levels of grip, ideal for areas such as disabled ramps. It is a durable finish suitable even for areas with light vehicle traffic. However, the bonded system is not permeable so there needs to be drainage in place, and over time excessive wear may loosened some stones from the surface causing bald patches. More about the Resin Bonded system here. There are many advantages to the Resin Bound system. One is that it is a permeable system; water will run straight through it which eliminates puddling and flash flooding. It is also very durable. We offer contractors a 10 year guarantee against our materials, but when laid correctly a resin bound surface should last well in excess of that. One main advantage is that the stones will not come loose or crumble away. Also, it is low maintenance: rain water will keep it generally clean, but any more stubborn dirt can be lifted with a light pressure wash. Weeds shouldn’t grow through if your sub-base is weed-resistant, but any weeds that may grow from birds dropping seeds can be pulled out easily. Though not as textured as Resin Bonded, a Resin Bound surface does also have enough grip for sloped driveways, ramps and disabled access areas. 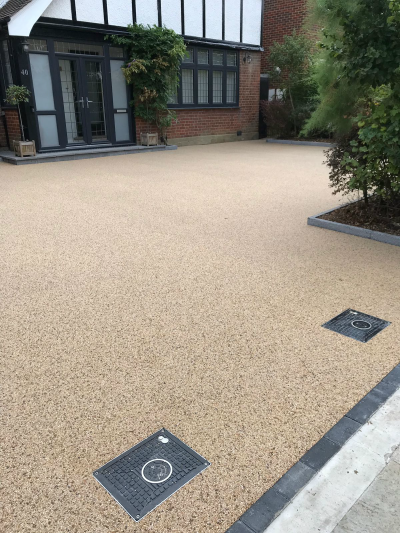 Another benefit is that the look of Resin Bound materials is modern and sophisticated, it can smarten any property in an instant. More about the BoundWorx® Resin Bound system here. I’ve made my choice – what should I look out for? You do need to be careful about the bound materials you choose. If you don’t want your surface to discolour and turn brown/yellow within weeks, then the resin you use must be UV Stable. Read more about what to look out for in a resin bound surface here. Both systems can be laid in a day, subject to the size of the area to be covered. 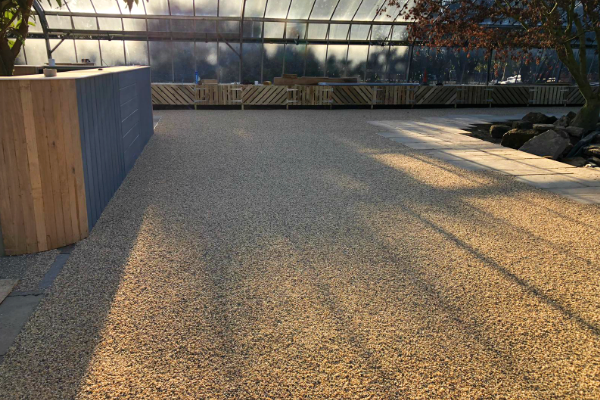 Similarly, both the resin bonded and resin bound systems can be laid over existing surfaces (subject to their existing condition) which often eliminates the need for expensive groundworks. If you are planning to lay over an existing surface you will need to be certain of its structural stability. Consult an engineer if you’re unsure, and always obtain a written guarantee from any contractor doing works for you. Contractors using high quality products and correct installation methods will have no problem providing you with this. Ok, so which system is cheaper? This is also a common question. However, if you are considering a resin surface then we urge you not to compromise based on cost. It is a decision that must be made by weighing up which system is most suited the intended purpose of your surface. Still a bit confused as to which is the best system for you? Do not worry. Contact us here or give us a call and we can talk through it with you to ensure you end up with the best finish for your purposes.